OK, so everyone talks about startitis in knitting, how we can’t find our mojo and find just the right project to jump start our desire. But what about the serious ailment of finishitis, where you have now started so many projects there is no way you will finish any of them in three life times. 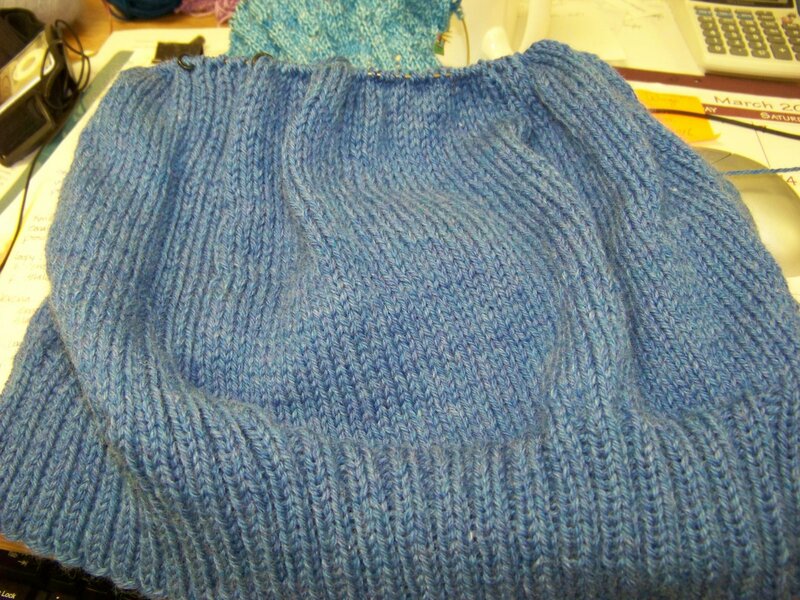 Now I am not talking about the usual UFO’s every knitter has languishing in the bottom of her knitting basket. No, I am talking about the knitter who within a matter of days begins 8 projects, because she wants to see how the new yarn from the recent fiber festival looks in lace or the project you just have to start for a sweater for you husband because God forbid you not have a easy, shmeasy stockinette project on the needles for potential movie dates. 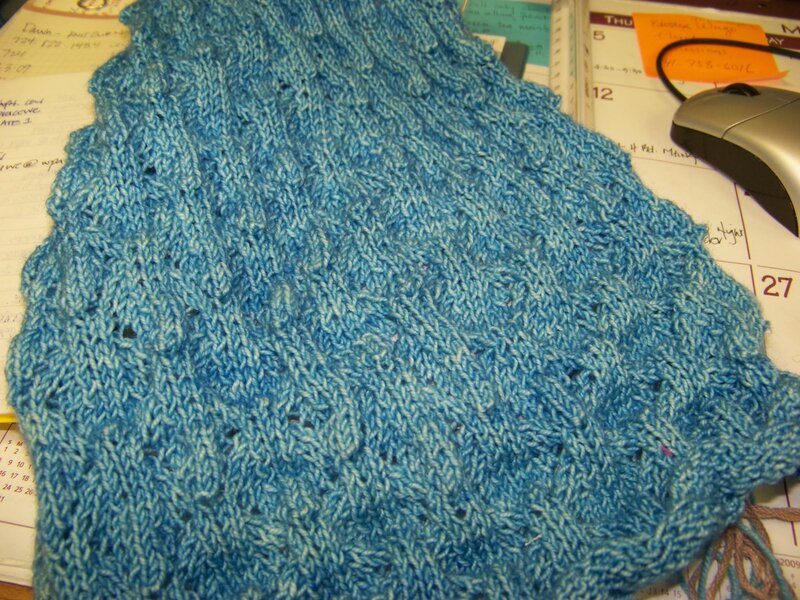 And then there are the projects you cast on just to test drive a new lace stitch pattern and before you know it you have knit the beginning of a beautiful shawl but abandon it for cables. 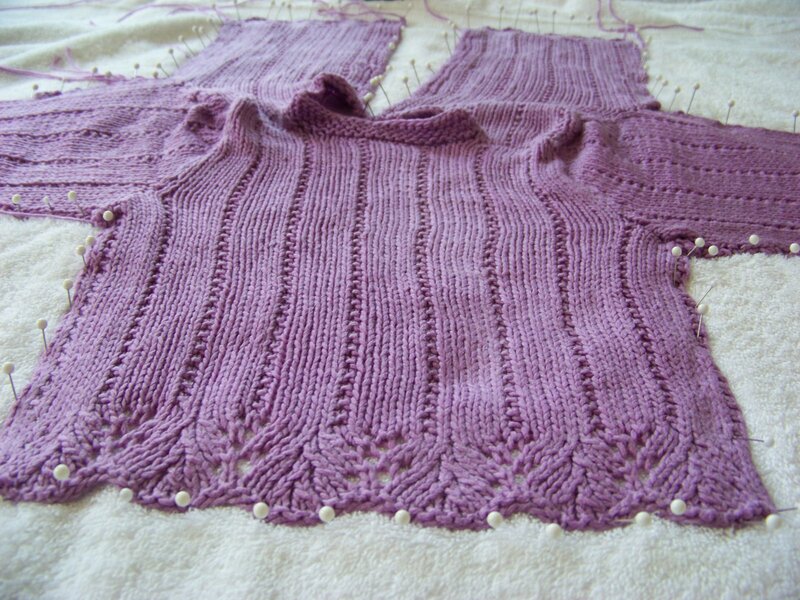 The cables are part of the top down Aran you have designed for your 20 something daughter and then abandon because she won’t be back from Costa Rica until May and certainly won’t be wearing this puppy until next October. 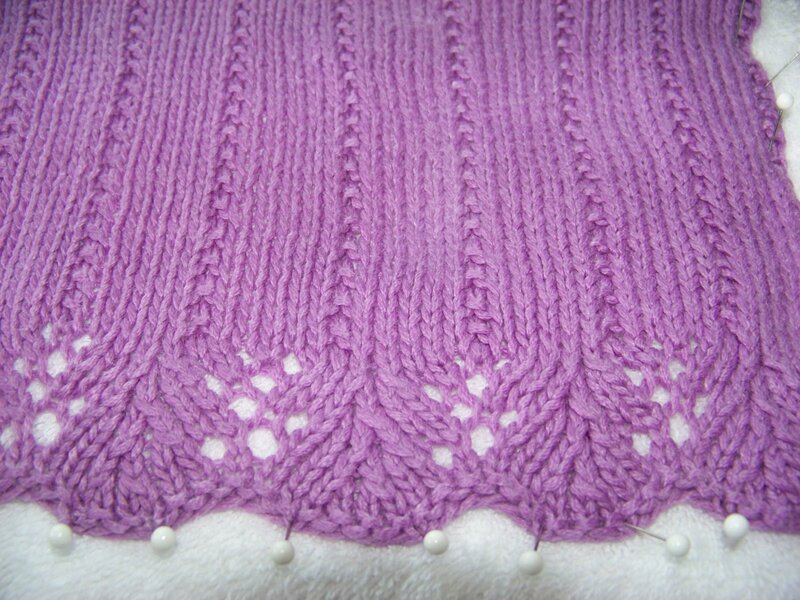 Then there is the baby sweater you must start for the baby shower this weekend. (That one is actually close to the finish line. It is pinned out and drying right now.) But what is a baby sweater with out a baby hat to go with it. So that one was cast on last night in a moment of such weakness I could weep. Oh, and let’s not forget the STR Holidaze colorway knit into a beautiful Old Shale pattern sock, inspired by Anne Hanson’s latest sock gorgeousness. The woman is an evil temptress, don’t you think. 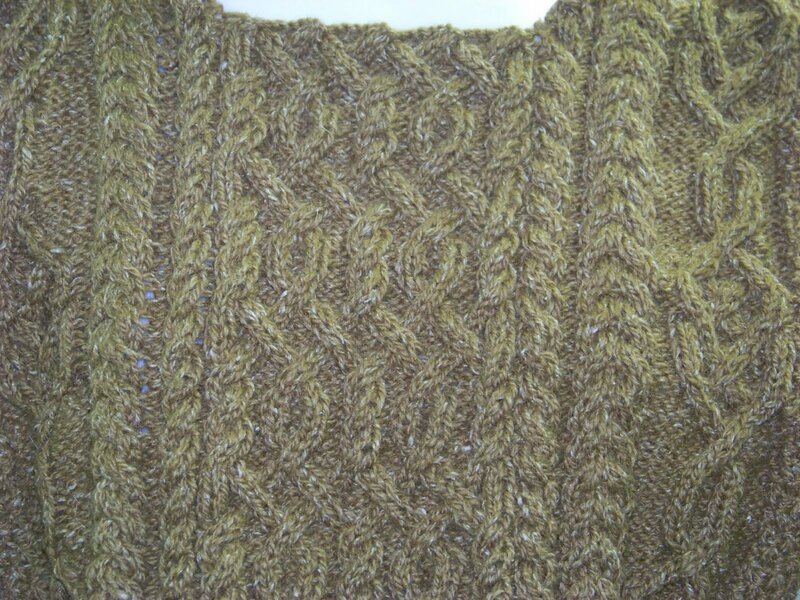 And the pattern I promised a friend I would rewrite for her with charts for her cables rather than the Marquis De Sade directions that came with a kit she purchased in Canada 3 years ago and has stalled mightily. (No joke, these directions would have given Einstein a headache so you can imagine what they are doing to my pea sized brain.) I have thrown the reams of written directions away and am just charting from the grainy, out of focus 4″ x 5″ picture on the front of the pattern.This required a little drive around the park to see how the cables look compared to the picture. There, I feel much better now. This must be what confession feels like. I have admitted I have a problem but I don’t see any solution in my future. 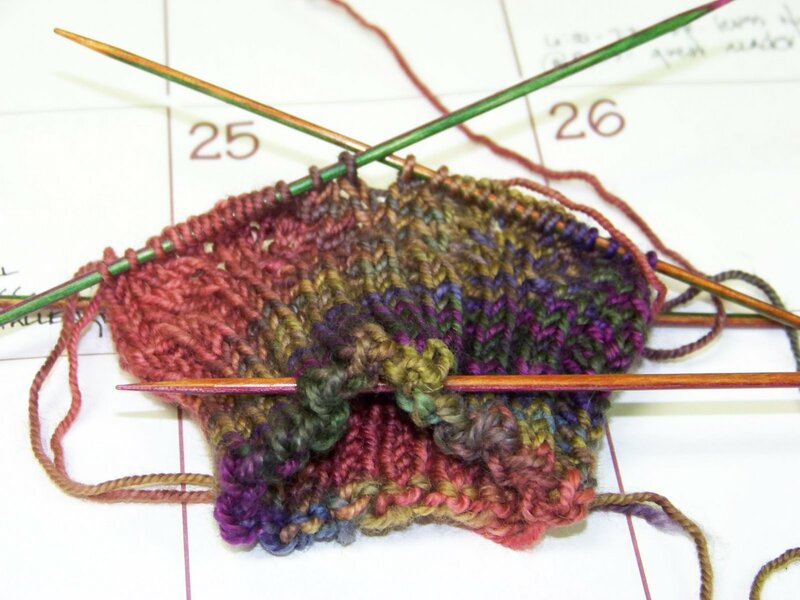 I just signed on to teach 5 new classes which will all need samples knit before I can teach. Is there a cure for finishitis? Even though I cannot knit, I am laughing at the “Marquis de Sade” reference you make to directions. Ha! Great description. Why is it that so many thing in life come with painful instructions when there is usually a better way? Thanks for a lovely first visit. TOO funny! 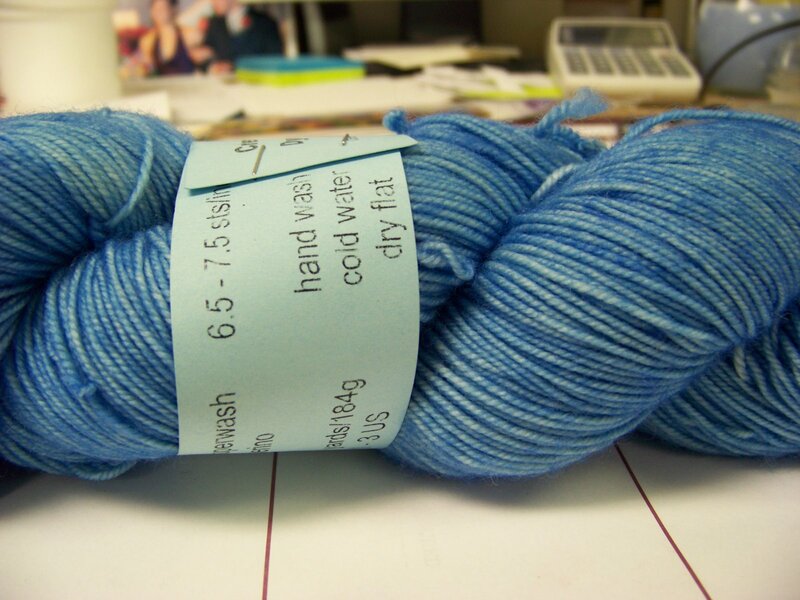 And of course, on top of all this, you’re blogging, too…That STR Holidaze colorway yarn is GORGEOUS!! Hi Margaret,I think we need to get you knitting. If only I were a little closer to NY. It is the perfect off season sport for a gardener. It gives you a whole new hole into which you can pour all your hard earned dollars in the winter when it would be foolish to buy plants. And books, there are lots of drool worthy books to purchase too. Sounds enticing, don’t’ you think.Thanks for visiting. I have told my cousins about your sister site. I am an only child but my cousin, Michaele, who is fighting stage 4 invasive breast cancer and her sister are incredibly different women but very close. We also have 2 daughters so I admit I peek over there sometimes to get some insight into their journey. Thank you for all you are doing. Hi KnitTwit, Isn’t it beautiful? If only I could concentrate enough to finish the socks they would be beautiful too, I am sure.We have had 70 degree weather here for the last few days so all I want to do is dig in the dirt. Thanks for visiting.